Thanks to a flying visit by my cousin - an art historian - last weekend I discovered William Morris's Arts & Crafts-style Red House in Bexleyheath. Set in the middle of a sprawling, moderately attractive (that's me being diplomatic) suburban jungle, the Red House was originally built when the area was mostly a sprawling orchard. 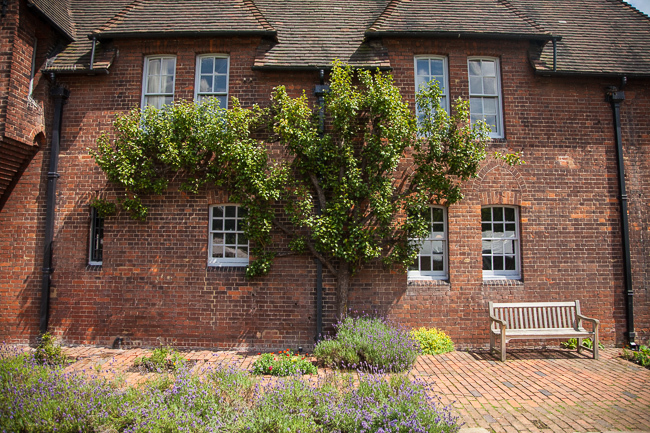 William Morris co-created the house - in which he lived for about six years in the 1860 - together with Phillip Webb, a neo-Gothic architect. Its L-shaped design was revolutionary at the time. While Webb focused mostly on the exterior, Morris was busy designing he interiors. It is still considered one of the most influential buildings in domestic architecture history, it influenced many European and American architects and designers who created their own styles, loosely based on Arts & Crafts. Now owned by National Trust, the Red House is not, as one would expect, a busy house brimming with old furniture, objects and designs. It's all a bit understated. Morriss's designs are there, some of the furniture is there, but the house is surprisingly low on decorative and practical objects. If you exclude some of the imposing, but bare cupboards and tables, a set of glasses and a couple of other items, the main focal points of the house are Morris's floral patterns (reconstructed by the house's last owners in the 1950s), its stained glass windows and garden. There are some interesting stories behind some of the pieces - the large wooden 'cupboard' (or settle) by the main entrance is one of them. In Morris's bedroom there's a previously undiscovered pre-Raphaelite Genesis wall painting. Next door you can see the how intricate some of William Morris's patterns were and how they were used to create the wallpapers inside the house. It's a quirky little place and while the National Trust volunteers were wonderfully enthusiastic and knowledgeable about the house, it was also fantastic to be able to see it through my cousin's eyes.